1 Pair of Socks:$8.506-11 Pair: $8.25 ea.12 and up: $7.95 ea. BURNING FIRE & FLAME SOCKS ... 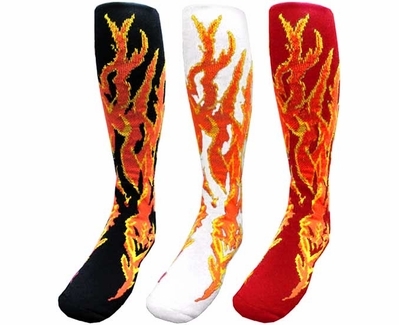 These Red Lion Brand Bright Flames Over-the-Calf Socks are literally On Fire! - HOT Flame Knee-High Tube Socks feature Orange Flames with Gold outlines, and are Now Available in Black socks, White socks, or Red socks. You'll definitely stand-out wearing these Fun & Wild Flame Socks. Burning Flame Sock Material: 79% Acrylic, 13% Nylon, 5% Polyester & 3% Spandex ... with Sewn-in Heel construction. NOTE: The Large Size is only available in the Black Sock color. Care Instructions: Due to the sewing weave method of these Fire Flame Socks - Hand Washing or Wash Separately on Delicate Cycle, and Tumble Dry Low is highly recommended. NOTE: We've done our best to show the true color of these Flame Socks, however since all monitor resolutions and brightness settings are different, these bright colors may look different on your computer screen. PLEASE call us if you have any questions about color-matching to uniforms, etc. Thank You. Great socks. My daughter gasped when she saw them. Said they were Really Fast Socks. Great service. They were delivered super fast -- way faster than I expected. Will definitely use this company again. Our softball team (12U) absolutely LOVED the socks and now they wear them to every game! At opening ceremonies everyone was complementing us. Delivery was quick and accurate! No issues! This is my second time ordering from you guys and plan on using you much more in the future!! Very quick shipping, correct sizes sent, and the quality is top of the line! Quick shipping & Good quality! Really nice socks and great price!! I bought 8 pairs of these socks for my daughter's basketball team. They are the Fireballs. Guess what? They won the championship. All the girls said it was the socks! I got these for my daughter's 10u volleyball team and they are super cute. Not only are they cute, but they are also made with great quality. I highly recommend and the best price. Great socks and matched our uniform very well. ProsSeem to be good quality. Thanks for getting them so fast to me!! Great socks! Purchased these socks for my "En Fuego" soccer team. They love them. Excellent company to work with!! Fast shipping & the girls love the socks!! Socks are thick and soft. Size medium and large are VERY LONG. But the girls like them! I got great compliments on these socks! They have good support and stay in place. AWESOME addition to our team uniform! The HEAT lacrosse team is on fire! Such cool socks! Super fast shipping and these socks look great while the girls play soccer. I got many comments in the golf course! Our team loved these socks and at each game competitors thought they complimented our uniform and team name. Fast shipping, good quality and great cost! Win Win Win. My team loves the socks and I received them quickly. They're soft and well made especially for the price. I ordered socks for my daughter's softball team from Q-sport last year and I only received 1/2 the order and the wrong size. However in the end they did the right thing paid for shipping of the wrong socks and sent the correct full order to me. So this year I was a little leery on ordering from here again. I really started to go over the reviews for the different companies out there. I was not too impressed so I decided to check out the Q-sport reviews. I was pretty shocked when I saw how good they all were. Well lets give them another shot I thought. I am glad I did. I ordered the socks on a Monday and they were at my house by Thursday. The order was correct. The socks both last year and this year have been a great quality sock. When it is time for all-star and even next season I will be placing my order from here. The socks are better than expected. They are thick and soft in the foot, and lighter weight on the top for "breathing". Very comfortable and fit great. Great for sports or costumes. I loved these socks in black and it looked like the yellow was bright enough to wear with neon yellow uniforms, but the yellow was more of a mustard color. We kept them anyway for a spare. Fit great - ordered small for my 6 year old and they work. I ordered the Sparks Flame Zany Knee Socks instead and the color was more neon yellow - perfect! ConsColor not represented well online. I purchased these socks for my 8U team. They are made of good material. Prompt shipment and delivery. Haven't worn these Flame Socks yet for a run, but they are comfy. Ordered these for my nephews and they loved the quality. The Socks were great! Helped me win the Best Dressed Men's category at the Elegant Scary Socks party that I bought them for. The team loves the socks. The volleyball girls are very happy with the flaming socks. ConsVery thick. girls not complaining though. These socks looked great! I like to wear knee socks for my races and have worn several pairs over the last couple of years. I wore these for a recent Tough Mudder event - 11 miles of mud, rocky hills and obstacles, many with water. Not ideal for that type of activity. By end of race my worst injury was the blister on the inside of my left foot. Probably best for either a shorter race or something without water. ConsNot ideal for the type of activity for which I wore them.